Arena footing—sounds easy enough, right? Decisions surrounding the footing you choose for your riding arena are a lot more complicated than you might think. Poor footing will subject your horse to increased risk of injury and long-term degenerative problems. As such, footing selections call for an informed and measured approach that takes a variety of factors into consideration. What kind of maintenance will this footing require? Do the pros of using this material outweigh the cons? Does this footing make sense for its intended use? Will this material interact well with the natural environment? Is it possible to combine this footing with additional materials for a better effect? If it sounds complicated, that’s because it is. Of course, any equestrian knows that caring for horses is no easy task! So long as you are guided by the will to create a safe environment for horses and their riders, everything—including dirt, sand and wood—will settle into place just fine. That said, some aspects of your arena footing are non-negotiable. Arena footings that meet these three necessary requirements can be comprised of a variety of materials—both natural and synthetic—as well as a combination of footing types. While there are countless products and formulas on the market, the most common footing materials are made from clay- or silt-based dirt, sand or wax coated sand, and wood products or natural and synthetic fibers. The arena footing materials you choose should be right for your regional environment and equestrian discipline. Before you even think about choosing an arena footing, you must have 100 percent confidence in your riding arena’s base. Solid arena bases adhere to high standards for the three D’s: drainage, durability and depth. If you live in a wet region or know your arena will be getting lots of traffic, it may be necessary to go beyond standard recommendations. Drainage: Opt for a strong base that will enable water to seep into the ground rather than flood the surface. Durability: Make sure your base is compacted above a 90 percent density so it will hold its integrity and keep rocks from creeping to the top. Depth: Keep your base layer at no less than four inches deep and up to one foot deep if your equestrian activities call for more support. Thinking about a horse arena of your own? 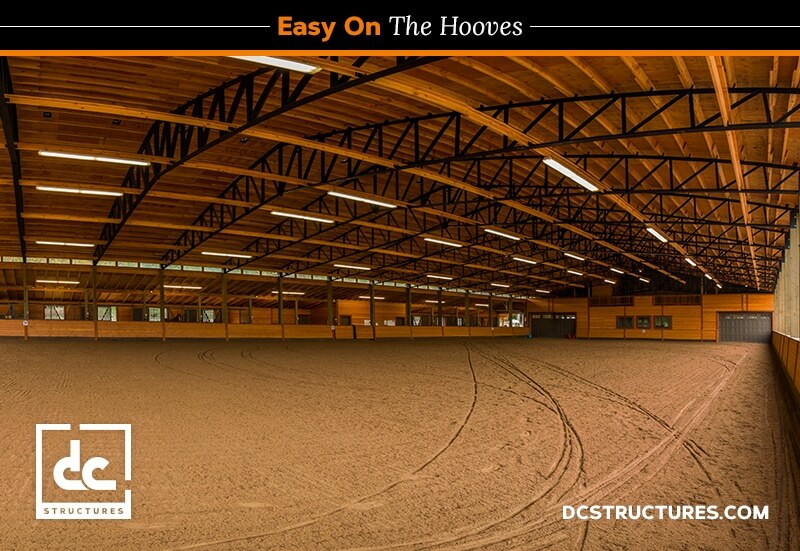 DC Structures offers two covered riding arena kits for year-round equestrian enthusiasts. Check out our Prairie arena kit and our Canyon arena with stables package. Request our digital catalog so you can get started on your dream arena.